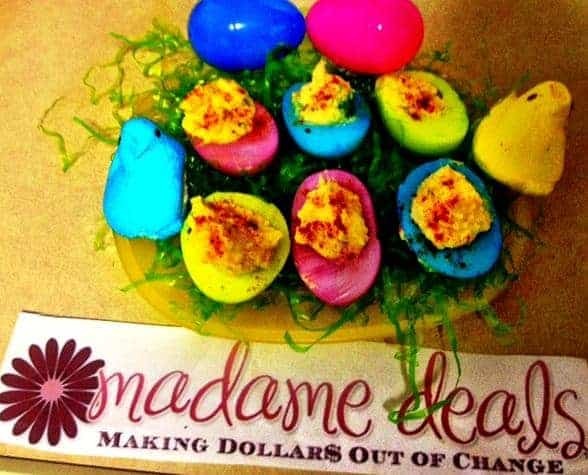 Kid Egg Recipes: Easter Deviled Eggs - Madame Deals, Inc. Step 1: Boil eggs for about 10 minutes, then set in the fridge to cool for about 30 minutes, take them out and peel them. 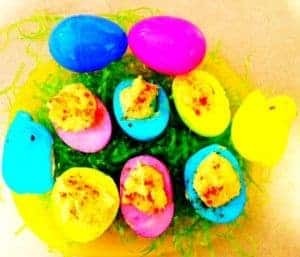 Step 2: Cut eggs in half and carefully scoop the yolk out, once you have halved all the eggs and taken the yolk out, mix the yolk with 2 tsp of mayo, and 1 tsp of sweet relish and set aside. Step 3: fill 3 bowls up with vinegar and food coloring. Step 4: Submerge the Eggs into the different colored liquid until you get the color desired. 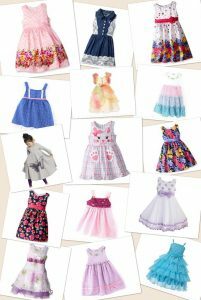 Set aside until you have dyed them all. Step 6: Fill all the eggs halves with the Yolk mixture and sprinkle the tops with Paprika. 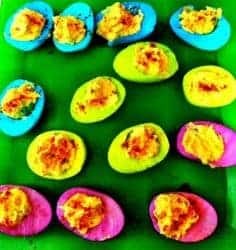 Step 7: Add some fun decorations like Easter Grass and Peeps to a plate and arrange the Easter Deviled Eggs onto a plate and serve! 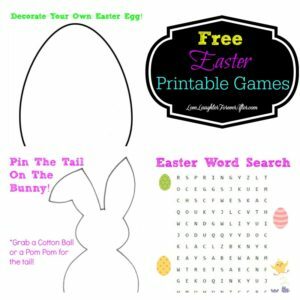 This is a great Easter Recipe for you and your kids to do together, and bring to any family or church event, they will be a great hit! 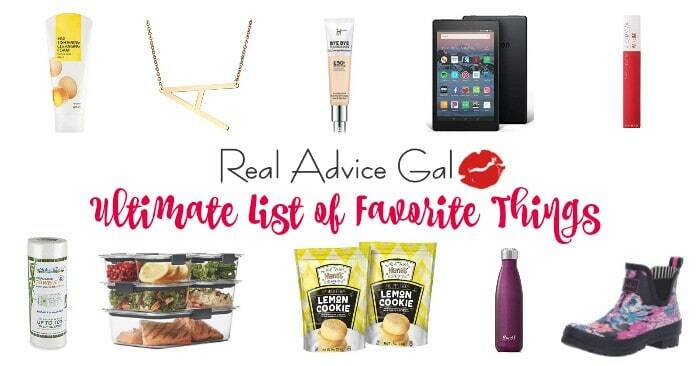 What’s also great about this recipe you can switch the colors according to what holiday it is! Green for St. Patricks Day, Black and Orange for Halloween, or even Red, White, an Blue for 4th of July! 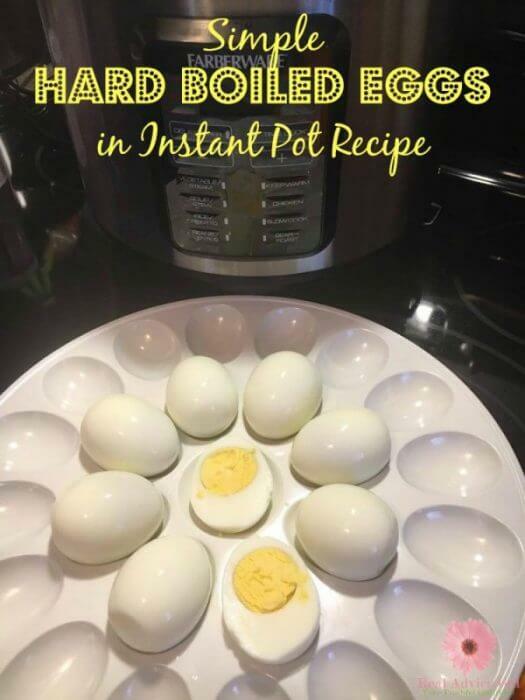 Check out this Simple Hard Boiled Eggs in Instant Pot Recipe. It’s the easiest way to cook eggs.